NYC’s first family is bidding adieu to Brooklyn. After six months in office, Mayor DeBlasio and his brood are moving into Gracie Mansion. Chirlane McCray, DeBlasio’s wife, made it official on Monday by announcing the move on her Tumblr. A six-bedroom space at One Beacon Court is the city’s most expensive new listing of the week, asking for $32.5 million. But if that’s too steep for you, you can always move into this one-of-a-kind, three-bedroom penthouse at 30 Bond, currently up for $5.5 million. During May 5th-11th, 79 condos sold for an average price of $2.3 million; while 103 co-ops changed hands for an average of a million. The market it quiet for this time of year, but a unit in One57 managed to sell for $20.4 million — the most expensive of the week. And what the heck is NoMad? You know your neighborhood has “arrived” once it’s christened with a new name — particularly an acronym. We take a closer look at what’s happening north of Mad. 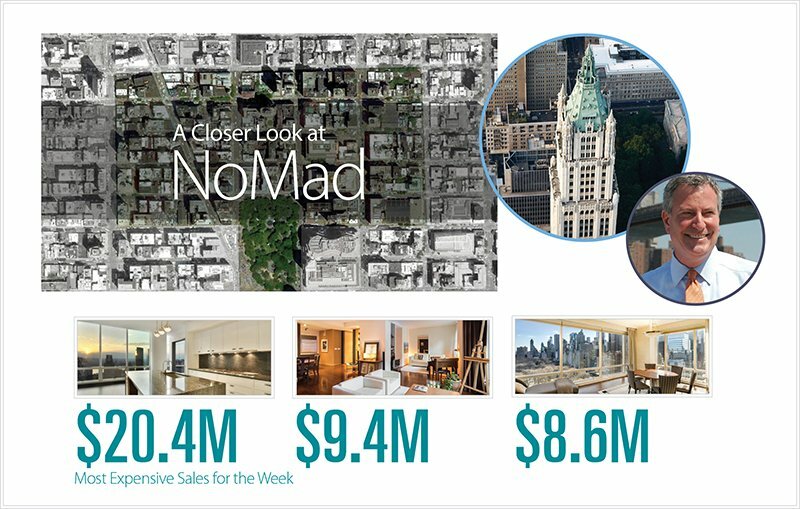 For market trends, the latest real estate listings, and an inside scoop on the city’s coolest buildings, we turn to CityRealty‘s Weekly Market Snapshot for the scoop.